Germany is one of the most popular destinations for studying abroad, with around 4,000 international graduates completing their doctorate there every year. 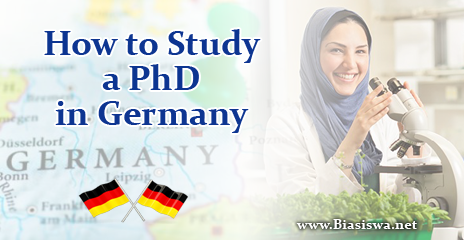 Read on to discover how to study and apply for a PhD in Germany. Why study a PhD in Germany? It's not difficult to see why Germany is popular as a study destination. It enjoys a global reputation as a world leader for technology innovation and research, has a robust economy and an attractive quality of life, and a particularly renowned tradition in fields such as engineering and manufacturing. Many German universities enjoy a strong international reputation, with 43 ranked featured among the world's top 800 in the QS World University Rankings' 2015/16. Among these, the prestigious research university Technische University Munchen is ranked first in Germany and 60th in the world, followed by Ruprecht-Karls-Universitaet Heidelberg in 66th place. As well as offering a high standard of living, Germany welcomes international students with low costs of study and good funding opportunities. PhDs in Germany do not usually charge tuition fees (see below), and more than a quarter of doctoral candidates in Germany receive public funding. What types of PhD are offered in Germany? This is the traditional option and remains the most popular. In this type of PhD you will produce your thesis or dissertation under the supervision of a professor, but you will mostly be working independently. The length of these PhDs varies, generally lasting three to five years. This option offers a great deal of flexibility, but also demands a high amount of personal initiative and responsibility. You are not limited to gaining your PhD by conducting research work at a university; you could also complete a project at a non-university research organization or at a German company in the industrial sector. You can also choose what is known as a structured PhD program. This involves a group of doctoral students being guided by a group of supervisors. There are over 700 programs of this nature available in Germany, often with an international make-up, with English as the team language. These programs differ from individual doctorate programs as students' research proposals have to fit in with existing PhD programs, whereas individual doctorates can be more freely structured to suit the individual research project. Which German universities offer PhDs? Many universities in Germany offer PhDs. The German Academic Exchange Service (DAAD) offers a database which you can use to search for the right PhD program for you. How much does it cost to study a PhD in Germany? Good news! Although master's courses in Germany are not free unless you have studied your undergraduate degree in the country, at PhD level, tuition is once again free at all universities in Germany � for the first six semesters at least. As at all levels of study in Germany, PhD students are also required to make a semester contribution of between �150 (~US$170) and �200 (US$230) to cover administration and other costs. This means your main expenses will be the general costs of living in Germany. If you need to apply for a student visa, you will be asked to prove that you have access to a minimum of �8,000 (US$8,990) per year. However, according to statistics published by the German Studentenwerk, this figure may not be a sufficient amount, as the average student in Germany needs about �820 (US$921) per month to cover living expenses, including rent, food, clothing, transportation, working materials, recreation and other costs. How do I apply for a PhD in Germany? There is no central admissions process or selection office for doctoral students in Germany, and the application process differs depending on whether you have chosen a traditional (individual) or structured PhD - for the latter, you will simply need to apply directly to your chosen university. Once you have found a supervisor, the responsible department or doctoral committee must confirm your eligibility as a doctoral candidate. This usually involves completing an application which includes a statement from your doctoral supervisor, certified copies of certificates, proof of recognition of your qualifications from the Dean's office, academic references and the university degree that enables you to participate in doctoral study. Your application may also include an English or German language test result, if applicable. The Student Office of your chosen university will review these documents and grant permission for you to commence doctoral studies. The next step is to enroll at the university. To be eligible for enrolment, the university must first accept your application for admission to doctoral studies. However, not all departments require doctoral applicants to formally enroll. You can find any requirements relating to enrolment on the university's official website. You must also make sure your postgraduate degree is recognized, obtain a residence permit and/or student visa, and ensure you have adequate finances for your stay. This will depend on your country of origin. Many students will find that they do not need a student visa, but do need a residence permit. You can find an overview of the countries for which a student visa is or isn't required on the Foreign Federal Office's website. No, however, we'd recommend learning at least basic German to help you get by in your host country, especially if you'd like to work during or after your studies. If you are studying an individual doctorate writing the doctoral thesis can often be written in English, while structured PhD programs frequently allow students to complete their doctorate in English. For further information on studying a PhD in Germany, read the DAAD's "FAQs - Doing a doctorate in Germany' PDF.